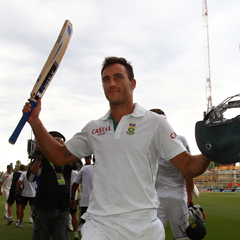 Johannesburg - Proteas rookie Faf du Plessis joined the International Cricket Council's Test rankings for batsmen in 56th position on Monday after a spectacular debut against Australia in the drawn second Test in Adelaide. Du Plessis, called up as a replacement for injured all-rounder JP Duminy, made 78 in the first innings and an unbeaten 110 in the second to save the match and keep the series square at 0-0 with one match to play. However, while Du Plessis made an impressive first appearance in the latest global rankings, South Africa's top order batsmen slipped in the table. Jacques Kallis, who made 58 and 46 in Adelaide, fell one place to fourth, while Hashim Amla, who contributed only 28 runs in the match, tumbled three spots to fifth. Australian captain Michael Clarke made 230 runs in the first innings, for his fourth double-century this year, to climb three places as he returned to the No 1 position in the global list. AB de Villiers dropped two places to eighth and Proteas captain Graeme Smith, who made a century and a duck in Adelaide, slipped one position to 11th. Meanwhile, Dale Steyn retained top spot in the rankings for bowlers, while fellow speedster Vernon Philander held onto second, level on points with Saeed Ajmal of Pakistan. Morné Morkel, who took eight wickets in the match, climbed one position to eighth. Kallis clung to the roof of the all-rounders' rankings, while the Proteas remained in No 1 spot in the Test Championship, three points ahead of second-placed England. South Africa will need at least a draw in the final match in Perth, starting on Friday, to hold off Australia, who are one point further back and will move to the top of the table if they win the game and clinch the series.